Musings Over a Barrel: Breakfast Stout. For Dinner. It was one of those rare fifth Tuesdays, and there was a cool beer featured at the Capital Ale House "Steal the Glass Night", so Colleen and I decided to head downtown for a quick beer and a bite. Our intention was to perhaps grab an appetizer but then come home for dinner. Well, we all know what they say about the best laid plans of mice and men. Capital Ale House was featuring three beers from Founders Brewing; Porter, Centennial IPA, and Breakfast Stout. We both decided to have the seasonal Breakfast Stout. After delivering our beers, the server told us about the evening food specials. One of these was a Schnitzel Sandwich, consisting of a breaded veal patty, served with sauerkraut and spicy mustard on a pretzel roll. It sounded so good that we decided at the same time that we'd have dinner too. The Breakfast Stout was pitch black with a frothy beige head. The aroma was that of bitter chocolate and espresso, but was surprisingly mild. The flavor is rich, dark coffee with a hint of bitter chocolate. There's a bit of sweet chocolate that rolls in at the end. The finish is dry with lingering bitterness. The beer is moderately carbonated with a thick mouthfeel. Founders Breakfast Stout is a rich and complex beer, and quite enjoyable. Even at 8.3% ABV, it's easy to drink and the alcohol is well masked. We very much enjoyed our food as well. 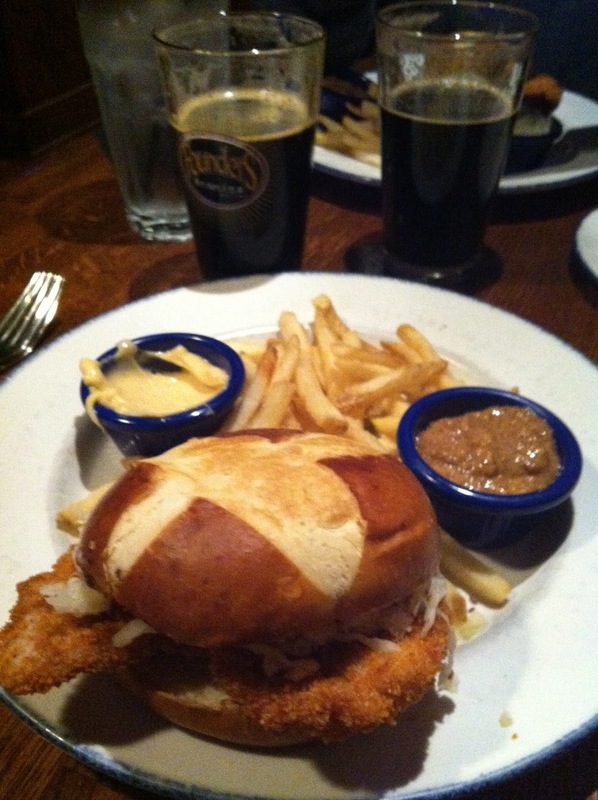 As with most Capital Ale House entrées, the sandwiches were serve with frites accompanied by a variety of seasoned mayonnaise. The flattened veal cutlets were a generous size, with a light breading and topped with a crispy sauerkraut that was tangy but not overbearing. The pretzel roll was sweet and light. I added a large helping of the spicy and sweet mustard to my sandwich as well. Colleen declared the dish one of the best meals we've had at Capital Ale House and I would agree. A fun time out with Colleen, good food, good beer, a couple of "stolen" pint glasses made for an enjoyable evening. Well, they say you can have breakfast anytime. I guess that includes breakfast stout, too.